A Chinese financial expert voiced his concerns about the difficult position the Chinese economy would be in if the current U.S.–Sino trade war drags on. He Jiangbing, a financial expert formerly with the Chinese financial newspaper China Times, warned that if the trade war isn’t resolved within two months, the Chinese economy “would directly enter into a collapsing state.” His comments were first reported by Hong Kong media Apple Daily on Aug. 16. He backed his claim with four arguments. One reason is that the U.S. dollar is strong and different U.S. finance-related indices are performing well. In the U.S., the S&P 500 index is up about 3.6 percent since the end of May. Meanwhile, investors have been selling Chinese stocks in sectors that they believe are more at risk of being hurt by U.S. tariffs. 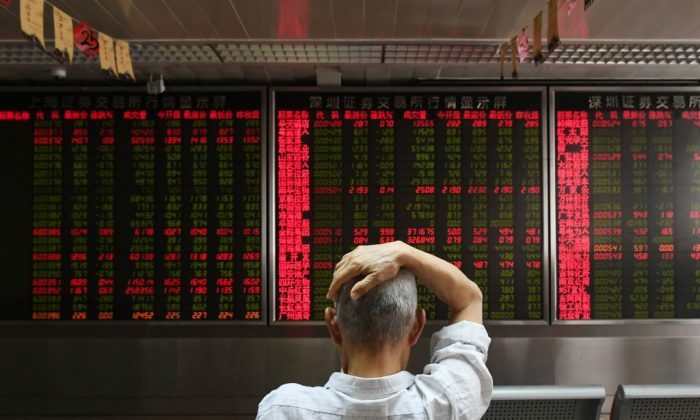 The SSE 50 Index, a blue-chip index of the Shanghai Stock Exchange, hit a 13-month low on July 5 and has fallen roughly 12 percent in the past two weeks. Another reason is that He predicts that the United States, after forming an alliance with the European Union to challenge China on trade issues, will soon add similar accords with Japan and Australia. In July, European Commission President Jean-Claude Juncker, after signing a trade agreement with President Donald Trump in Washington, agreed to assist the United States in taking China to task on its trade abuses and reforming the World Trade Organization (WTO). Meanwhile, China’s partnerships with some countries have fallen apart. That’s because of fallout from China’s “One Belt, One Road” (OBOR, also known as Belt and Road) projects, Beijing’s massive investment initiative with countries throughout Asia, Europe, Africa, and some Latin American countries. Not only has OBOR failed to help the Chinese economy, according to He, but the initiative has sparked a trade war with Pakistan. Pakistan has traditionally been a strong ally of China. The two nations have enjoyed strong economic ties in recent years because of the China-Pakistan Economic Corridor (CPEC), a collection of OBOR infrastructure projects, including a China-funded deep-water port that is intended to modernize Pakistan. While economic gains for Pakistan from the CPEC remain a subject of debate, the government has seen its current account deficit widen after massive imports of Chinese equipment and materials for building the OBOR projects. Pakistan recently asked the International Monetary Fund (IMF) for a bailout, but the United States warned the IMF against providing such aid—presuming that any bailout funds would simply go to the Chinese lenders. Finally, He points out that the price of goods such as vegetables, poultry, and paper has been rising in China for recent months. Yet, China will need to continue importing and paying tariffs due to insufficient domestic production. Additionally, a recent spike in consumer price index (CPI) would force Chinese banks to boost interest rates, which could lead to an economic recession, He said. For the month of July, Chinese officials reported a 2.1 percent increase in CPI, compared with the same month a year ago, but the actual increase may be as high as 25 percent, based on prices that local citizens have reported in central China’s Hubei Province.